Finding the right camera is about capturing the moments that mean the most to you. Whether it's a once-in-a-lifetime vacation, a holiday family portrait or just a trip to the park, you want the camera that can meet your needs. Although there is a lot of technical information available, don't feel like you have to learn all the details to make an informed, confident decision. Use this guide to help answer the basic questions you have in order to find the right camera for you. What's most important to you when it comes to taking pictures? Maybe it's an easy-to-use camera you can slip into your pocket for candid shots of your kids. Or maybe getting the perfect photo of a sunset or dew-covered rose is worth carrying around a more advanced camera. The best place to start figuring out what you need is to ask the right questions. What type of photos do you want to take? 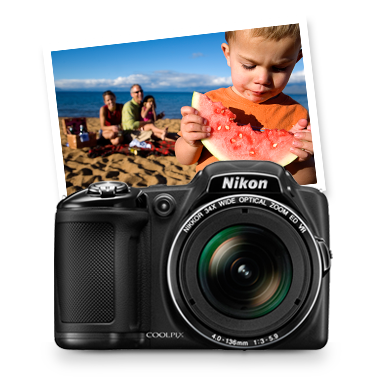 Need a camera for a family reunion or a weekend trip with friends? 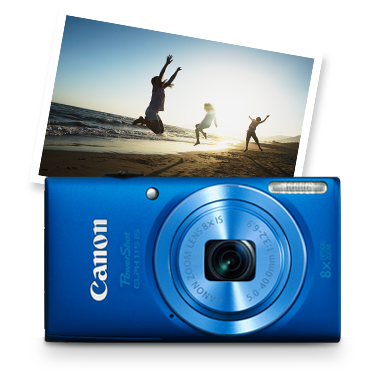 A high-quality point-and-shoot is small enough to fit in a purse or large pocket and even lets you capture short videos. If you're an outdoor adventurer, you need a camera rugged enough to keep up with your lifestyle. Action cameras let you wear the camera or mount it on your equipment for in-your-face video footage. 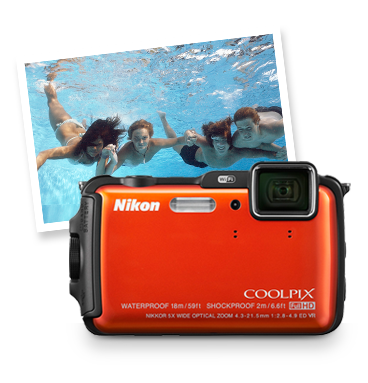 Waterproof cameras can easily handle accidental splashes or wet weather, and some are submersible for use while snorkeling or swimming. Shockproof cameras are designed to withstand jarring bumps and drops, and freezeproof cameras work well even in extremely cold conditions. A long-range zoom will come in handy here, giving you the flexibility to take pictures up close or at a distance with a single lens. You'll get the sharpest photos with a mirrorless camera or DSLR camera. You'll also get the chance to improve your photography skills with interchangeable lenses, precise manual focusing and better results in low-light settings. What kind of camera are you willing to carry around? If you love the appeal of a DSLR camera but can't see yourself carrying it around all day on a sightseeing trip, you might be better off with a smaller, lighter camera. When image quality matters more than size, however, a DSLR or mirrorless camera with a larger sensor and more features is worth the extra weight. Even if you already own a DSLR camera or plan to purchase one, there may be times when it makes sense to have a point-and-shoot camera as well. Different types of cameras work best in different situations. While a smartphone is convenient for spontaneous shots, a point-and-shoot gives you better quality for all-day events, and a DSLR gives you even higher quality for when it matters most. With the rapid advances of camera technology in smartphones, you may be wondering, "Why do I even need a digital camera at all?" Good question. Smartphones offer respectable quality when it comes to capturing spur-of-the-moment photos and videos, but they often fall short when it comes to image quality. A digital camera features a much larger image sensor than the tiny sensors available in phones. A bigger sensor produces clearer, more vibrant photos than a smaller sensor, even if the number of megapixels is the same. Digital cameras shoot better in low light or when you need to zoom in on your subject, along with featuring more versatility and settings options, longer battery life, better flash, a larger lens and a larger maximum storage capacity. While a smartphone is convenient for when you don't have your camera handy, using a digital camera will give you better quality photos that you'll treasure for years to come. Available in a wide range of models, from basic to true professional-grade, point-and-shoot cameras aren't just for novices. From rugged cameras for adventure seekers to premium models that offer impressive performance in an ultracompact package, there's a point-and-shoot camera to fit almost any need. Slim, lightweight and pocket-friendly, these cameras offer a step up in image quality compared to most smartphones. Optical zoom lets you capture more detailed close-up photos, and faster shutter speed reduces blur on action shots. 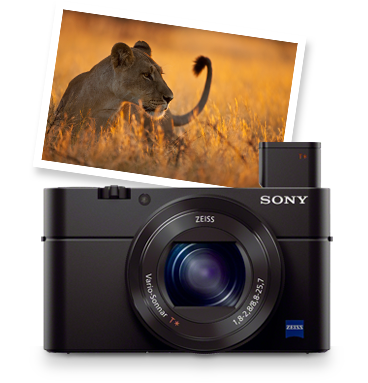 The larger image sensor and lens of a point-and-shoot also capture better photos in low light. Some of these cameras offer built-in Wi-Fi for easy sharing. If you need a camera tough enough to survive your next snorkeling trip or rock climbing expedition, invest in a waterproof or shockproof camera. With a solid, weatherproof exterior that can keep moisture out or even be submersed in several feet of water, waterproof cameras are safe to use in almost any weather or environment. Plus, they're just as at home at the beach or in the backyard as they are in more extreme environments. If you need a camera that can withstand shock from drops or freezing temperatures, invest in a shockproof or freezeproof camera. Although the toughness and durability of these cameras makes for a slight increase in size and weight, the payoff is a camera you can take almost anywhere, without worrying about accidental damage. For the best all-terrain protection, get a camera that boasts all three of these features together – waterproof, shockproof and freezeproof. A camera this rugged will be tough enough for almost any adventure. Without enough natural light entering the lens, the pictures you take indoors or outside at dawn or dusk can appear grainy and dark. That's when you need a low-light camera with a larger image sensor (or high ISO sensitivity) to capture more light. As a bonus, the larger pixel size will also give you better pictures in bright light and any other setting. Getting crisp, clear images in low-light settings is not about how many megapixels are crammed into the sensor but about the size of each pixel. A larger pixel size can capture more light. So can a larger maximum aperture. The larger the maximum aperture (i.e., the lower the f-stop number), the easier it will be to take high-quality photos in low-light settings without a flash. If you want to get close to the action or zoom in on distant subjects while traveling, a long-zoom camera gives you the flexibility you need for shots at almost any distance. Long-zoom cameras feature at least 10x or greater optical zoom, with some models featuring 20x or greater optical zoom. The longer the zoom range, the closer you can zoom in on details from far away. For example, a camera with 10x optical zoom might allow you to frame the silhouette of an old barn from a distant hillside, while a camera with 30x optical zoom would allow you to frame the weather vane on the barn's roof. Long-zoom cameras sometimes include an electronic viewfinder (EVF) for easier shooting outdoors, where bright light can obscure the LCD screen. The electronic viewfinder also enables precise framing of the exact shot you want to capture and reduces blurring as a result of holding the camera close to your body as you peer through the viewfinder. Holding the camera away from your body increases camera shake, especially at longer zoom ranges. Look for a camera with image stabilization to further reduce blurring when taking pictures with the zoom extended. 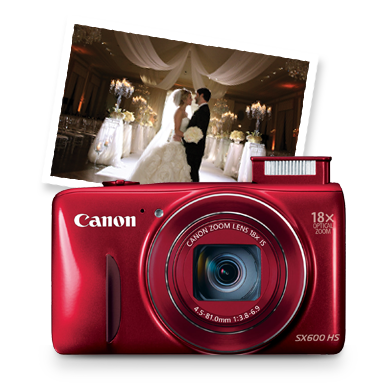 Point-and-shoot cameras span a wide range of options, from basic entry level to high-end models. Premium models offer the best of the best when it comes to point-and-shoot, including sharper lens quality, more durable construction and advanced features. Even though they may look the same as a basic model, the technology and features packed inside are what set these cameras apart. A larger aperture allows for excellent low-light performance, and, with a faster shooting speed and quick autofocus, you can capture an image at the exact moment you want. Besides the auto modes available on all point-and-shoot cameras, some premium models also come with a manual control option, which allows you to shoot creatively with fewer limitations. You may also be able to shoot in RAW format for advanced editing. Maybe you're a daredevil who likes to skydive, or you're a skier who loves the double black diamond runs. And maybe you're disappointed by the quality of your fast-action shots, or your camera equipment has suffered over the years because of your high-adrenaline lifestyle. If so, action cameras are made for you. They're rugged enough to withstand the elements and advanced enough to provide stunning, high-resolution photos and videos. Just clip the camera to your clothes or mount it to your helmet or equipment for up-close footage that's immersed in the action. Wi-Fi connectivity allows you to upload photos and videos directly to your tablet or smartphone for instant sharing. It's never been easier to capture and relive all your adventures. If you're asking, "What is a mirrorless camera?" you're not alone. It's a fairly new type of camera that many people are just learning about. The mirrorless camera, formerly known as a compact system camera, is a hybrid between full-function DSLR cameras and convenient point-and-shoot cameras. Mirrorless cameras are typically smaller and lighter than most DSLRs, since they omit the optical viewfinder and mirror box, but they have a broader array of features and functions than point-and-shoot cameras, such as faster autofocus and shooting speed. A big difference between a mirrorless camera and a point-and-shoot is the interchangeable lens. Like with a DSLR camera, this feature gives you the ability to change lenses based on the type of photos you want to take. With a mirrorless camera, you'll get both the premium image quality and interchangeable lens system of a DSLR plus the compact camera body of a point-and-shoot all in one convenient package. A DSLR camera, or digital single lens reflex camera, is the clear choice if you want to take your photography to a higher level. Let's dispel the myth that DSLR cameras are for the pros, or those who have the ability to invest huge chunks of time into a photography hobby. It's just not true. The great news is that you don't need to be a professional photographer to use a DSLR. The technology has evolved to the point that just about anyone can pick up a DSLR camera and start shooting significantly better photos – today. The big benefit of a DSLR is its versatility. A DSLR camera is a must-have for the pro who wants complete manual control. But it's also a great option for casual photographers looking to improve their photography skills and even parents who want a fast-acting, autofocusing, don't-want-to-miss-that-shot camera to capture their kid's big moments. The ability to choose from a wide variety of lenses is also a major benefit to owning a DSLR camera. Although there's a lot to learn about DSLR cameras, there's no need to be intimidated. Our DSLR Buying Guide will help you understand the basics and explore which DSLR camera is right for you. One major benefit of owning a mirrorless camera or DSLR is the ability to switch lenses in order to get the exact shot you want. The type of lens attached to your camera is what allows you to capture a wide variety of creative images, including detailed photos of subjects as tiny as a bumblebee or wide-angle shots of a sweeping landscape. Zoom lenses allow you to capture subjects up close or at a distance by changing the focal length. The longer the focal length, the farther you will be able to zoom in on your subject. Prime lenses, on the other hand, are fixed at a specific focal length, but they typically produce sharper images and perform better in low-light settings. To learn more about lenses, take a look at our Lens Buying Guide. Now that you have a better understanding of the types of cameras available and how you might use them, let's take a closer look at the technology inside these cameras. Although it's helpful to understand how things like megapixels, sensors, aperture and zoom work together, keep in mind that most cameras have fully automatic modes, including autofocus. So even if you're new to photography, you can start taking frame-worthy photos right away, without knowing all the ins and outs of how it happens. Megapixels or image sensors: Which is more important? If you're confused about what the "right" number of megapixels might be for your needs, you're not alone. It used to be a common thought that more megapixels equaled better photos. But that's not the whole story. Cramming too many megapixels onto the sensor makes for tinier pixels, which can't capture light as easily. The result is noisy (or grainy) photos. Bottom line? Rely more on the size of the camera sensor to determine image quality than on the number of megapixels. The sensor is the technology that actually uses the light brought into the camera to create your image. The sensor can be just as important as the number of megapixels when it comes to image quality. In fact, when you're looking at a camera sensor, bigger is better. This is why a camera phone with a large number of megapixels may produce inferior photos compared to a digital camera with fewer megapixels. The sharpness and detail of an image depends heavily on the quality of the lens. A fast lens (with a large aperture or low f-stop number) captures more light, which improves the camera's performance in low-light settings. A larger aperture also allows you to focus on a small portion of the scene and blur the background for a soft, stylish effect. The ability to shoot high-quality videos is one of the bonuses of owning a digital camera. When a single shot won't fully capture the moment, switching to video mode allows you to record memories you'll treasure forever, such as your baby's first steps or your daughter's graduation. For the highest quality videos, choose a camera with 1080p HD recording for crisp, detailed videos with a professional feel. You'll also want to look for a camera with video-specific autofocus technology, which ensures that your subject always stays in focus, even while panning or shooting fast-action videos. Because of the larger image sensor compared to a smartphone camera, most digital cameras shoot higher quality videos, especially in low light, with DSLR cameras boasting the highest video quality. It used to be that you could only frame the shot by peering with one eye through a viewfinder; however, today's digital cameras feature an LCD screen that allows you to frame the shot by looking at what's on the screen. Some cameras feature both a viewfinder and an LCD screen, while some only include the LCD. A higher resolution LCD screen displays the image in sharper detail. Touch screens allow you to change settings and navigate menus on your camera using touch rather than pushing buttons. For shooting videos or capturing images at odd angles, an articulated LCD screen comes in handy. These screens rotate so that you can see what you're shooting even if you're holding the camera above your head or crouching low for an artistic angle. Since shooting in bright sunlight can make it difficult to see what's on the LCD screen, some cameras also feature an electronic viewfinder that allows you to frame the shot by holding the camera up to your eye. This also helps stabilize the camera and reduce camera shake when the zoom is extended for long-distance shots. One of the best parts of taking photos is sharing them with people we love. Built-in Wi-Fi allows you to upload photos to your smartphone or tablet for easy wireless sharing, and some cameras even allow you to post pictures and videos directly from your camera to Facebook, YouTube and other sites. GPS technology tracks the exact location where each photo was taken, allowing you to create a visual map of places you've traveled. And if you're concerned about privacy, you can always disable the GPS tracking. Wi-Fi and GPS capability are available on a wide range of point-and-shoot cameras, as well as some DSLR and mirrorless cameras. Some include both Wi-Fi and GPS technology – both features are especially popular with travelers, or anyone who likes to shoot and share on the go. A wide range of features is available that can help you take better shots with less effort, such as burst mode, scene selection and smile shutter. As technology advances and cameras become smarter, it's easier than ever for anyone to take professional-looking photos. 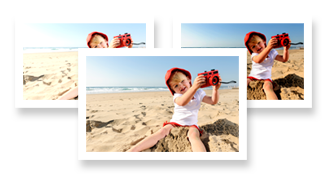 Here are just a few of the special features available on many digital cameras. Wish you could capture the entire landscape in one seamless photo? Panorama mode allows you to take several pictures and then stitch them together into a single shot – a feature used most often for sightseeing and nature photography. Instead of leaving it up to your camera to determine the correct settings for the photo you want to capture, you can select a scene mode such as portrait, landscape, beach, sports or night mode. Your camera will automatically adjust the settings based on the mode you select. You can also choose creative modes, such as black and white or sepia, for an artistic look and feel to your photos. How does your camera know where to focus, with so many subjects in the background? 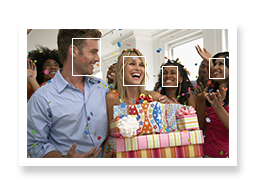 Face detection ensures that if you're taking pictures of people, the camera will autofocus on the subjects' faces rather than on objects behind and in front of them. Most cameras with face detection are able to focus on multiple faces at once for better group shots on the first take. Not sure how to choose the right exposure and settings on your camera? Cameras with an HDR function can take multiple pictures of a single scene – all at different exposures. Then the camera chooses the best parts of each photo and combines them into one great shot. This is especially helpful for high-contrast scenes, such as when you're struggling to get just the right exposure for both a bright sky and a dark landscape. Now that you've learned the basics and have a better idea of what you're looking for in a camera, here are a few suggestions about choosing accessories. • Don't forget to pick up a memory card to store your photos and videos. • First-time camera shoppers should consider package deals that include a camera bundled with accessories, such as a memory card, camera bag and/or additional lens for a DSLR or mirrorless camera. You'll save more on a package deal than you would buying each item separately. • Be sure to protect your purchase with the right bag and lens cleaners; plus find other accessories to complete your purchase, such as extra batteries, tripods, chargers and more. BestBuy.com offers you a huge selection of cameras of all types. Your local Best Buy store has a wide variety to try out and compare. Plus, our Blue Shirts are on hand to provide answers and superior customer service.